Hip Hop and Breakz: Is Fat Joe an Arsenal Fan ? We all know Fat Joe as the overweight DITC member who jumps from hip hop band wagon to hip hop band wagon pledging allegiance to whatever crew will have him. He has however dropped a good few dope tracks over the years working with producers like Premier, Finesse, Showbiz and the Beatnuts to mention a few. But it appears that in between dropping tracks with Ja Rule and Ashanti he's been popping over to North London to see Wenger's boys play a few games. 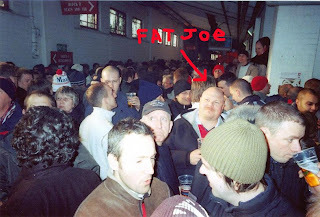 A friend of mine sent me this picture taken at the old Arsenal stadium and either Fat Joe has been popping over to Highbury or he has a a twin, other Big Pun that is. I thought he may Represent the better North London Team, Spurs. Thanks for the picture Howard. Check the link below for one of Joe's finer moments with Premier. I might be just me, but that doesn't look like joe. He looks white.